Amongst the whirlwind of costume fittings and script readings, the UVM theatre department is re-evaluating itself. With 84 majors and minors and 13 faculty and staff members, the department is a tight-knit group, Gregory Ramos, chair of the theater department, said. “We are a predominantly white department at a predominantly white college in a predominantly white city,” he said. Both shows have characters that are explicitly people of color, and finding the right actors to fill those roles poses a problem, Ramos said. 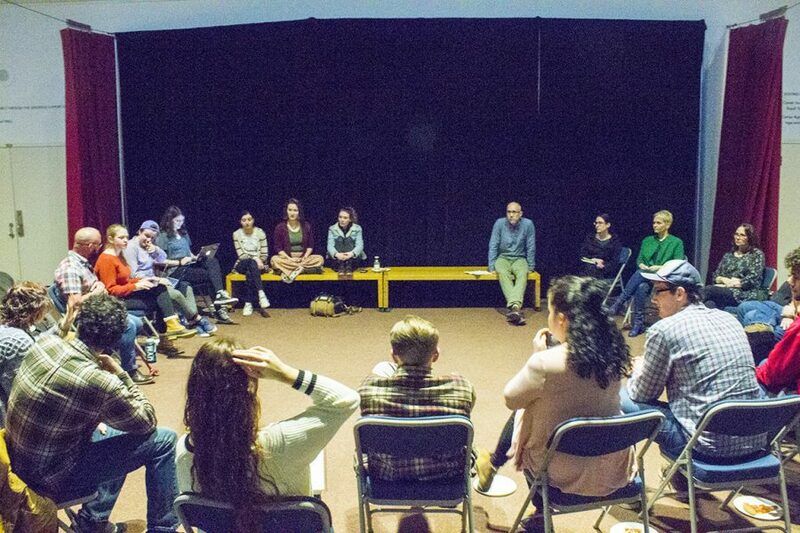 Students, faculty and staff gathered in the Royall Tyler Theatre, the physical heart of the theatre community, to discuss diversity at a forum Feb. 27. Elected student representatives prepared questions to prompt for discussion. “We sent out a form to all the majors and minors and got some really good feedback which we condensed into four points,” junior Juls Sundberg said. The first item on the agenda was to discuss what can be done to get a more diverse turn-out at auditions. “[To avoid tokenism], we need to make sure people of color know that they are welcome here without telling them that we need their bodies but don’t care about their ideas,” senior Stephen Indrisano said. The second topic discussed was how to to make the curriculum more diverse, specifically in terms of adding more plays by playwrights of color, and plays with more characters of color . Professor John Forbes acknowledged that his theater education consisted of reading plays exclusively by dead, white men and that students’ expectations have changed since then. Students at the forum also wanted to know what the procedure is when a bias complaint is lodged within the department. Students and faculty agreed that they would include information on reporting a bias incident inside Royall Tyler alongside the safety information that’s already available. “Before the forum, I didn’t even know what the procedure was and I just thought that was concerning,” Sundberg said. Bias complaints are not common in this department, Ramos said. Senior Oak Horton has filed a bias complaint before, though not against anyone in the department. “It was taxing to put in so much effort and time and go through so much stress to make all the meetings only to have nothing done about it,” Horton said. Horton, who is black, decided not to attend the diversity forum, they said. “It felt like a waste of time to try to talk to people about racism and it might tarnish my reputation in the department because I have negative things to say about specific professors,” Horton said. They pointed to incidents such as how the white students in make-up class use the color “creamy peach,” but that color is given to all students regardless of skin tone. Indrisano said he thinks theater students would be interested in a lecture about costuming diverse students. “Those are the kinds of lessons students want to see,” he said. Indrisano said artists in the department have to a duty to promote diversity. “In this climate we’re in, it’s our responsibility to not shut out the real, but to lean into it with our action and our art,” Indrisano said.